Sometimes you have to get outside to do some writing. Even if it’s just for twenty minutes, a change of scene does you good. I’ve been writing a lot at my allotment. It’s quiet, not too cold yet, although I do sit in the greenhouse with the heater on occasionally and sometimes inspirational. I wanted to write an autumnal, Halloween inspired story. What could be more autumnal than apples, with all their ducking and bobbing? There is an orchard on the allotment, in the centre of which we devised a secret seating area. You won’t be seen or disturbed. It was the best place to write my gruesome little story called, ‘Windfalls’. You can download it along with many other stories and great artwork in the Sirens Call ezine, ‘Halloween Screams and Other Dark Things’ below. Enjoy! Not long home from my annual holiday in Howarth,Yorkshire. Lots of hiking and hill walking ( and lots of stopping to get my breath!). Halloween has hit this little village early. 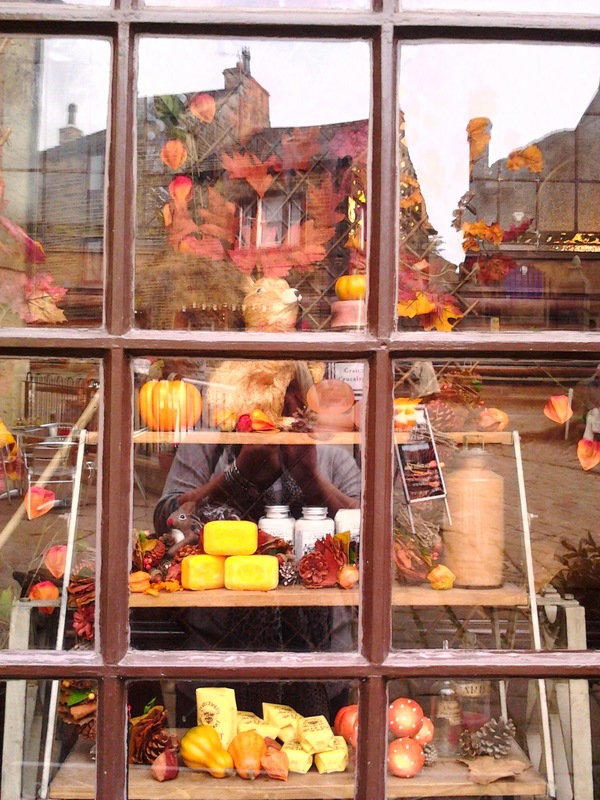 The ghost tours have begun, ‘Howartheen’ is being advertised and the pharmacy has one of the best shop window displays ever seen, I just wish I could have taken a better photograph. 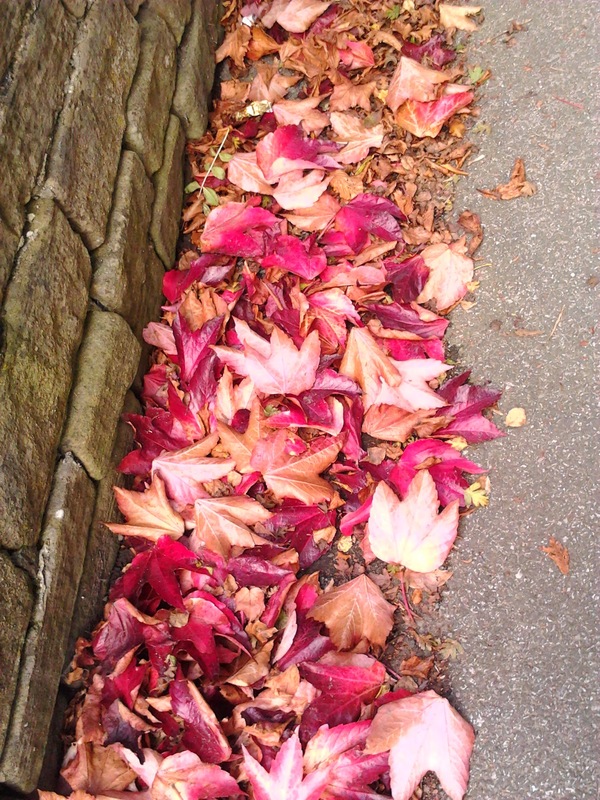 Despite the weather being ridiculously warm for this time of year, the trees had begun shedding their leaves, the foliage was beautiful. 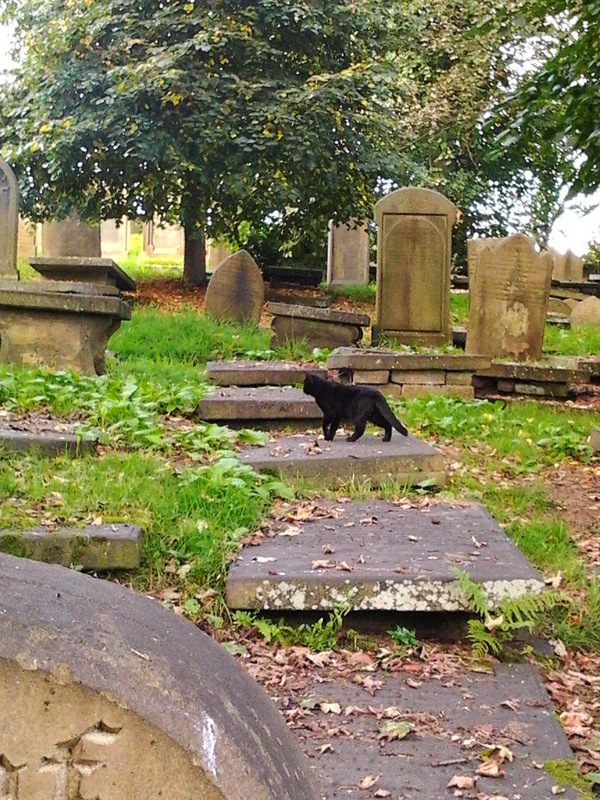 … and to round our trip off, a treat for every Goth, Hammer Horror fan and cliché ridden ghost film; a black cat in the Bronte Parsonage graveyard! “Why?” said the second woman. I had to walk away. More fool you for paying it. Did he really need a cloak? Is he a magician? Is he a Victorian dandy? I don’t think so. As I paid for the tins of sweets today,(Yes,Yes more fool me for paying for them) sweets that I will give out to the ‘Trick or Treater’s’ tomorrow, I mourned the loss of the Halloween or ‘Duckapple night’ of my childhood. There was no pressure for parents to have a costume ready for us (not that my mam would have paid for one. I would have been the kid wearing the bin bag!) just ghost stories and chipped teeth from trying to bite a bobbing apple in a washing up bowl filled with cold water without getting your fringe wet. I’m not a Hallowmisery, I write Ghost and Horror stories !This is my favourite time of the year! Maybe I am nostalgic for the fear and anticipation Halloween brought me as a child. The only excitement children seem to experience now concerns the amount of sweets they receive. Bring back ‘Duckapple Night’ and the true sense of Halloween!